To better estimate future consumption needs, the GIS team developed a model to calculate historic billing for user-loaded areas of interest and deployed a website that staff could use to see historic consumption data. Keeping water and sewer pipes operating smoothly in Greece’s second-largest city of Thessaloniki, with 1.5 million inhabitants, is a complex endeavor. The Thessaloniki Water Supply and Sewage Company, known by its Greek acronym EYATh, manages more than 1,400 miles (2,300 kilometers) of water pipes and almost 1,200 miles (1,900 kilometers) of sewer and storm water pipes, in addition to numerous tanks, pump stations, and waste treatment plants. The utility has to coordinate the activities of many different divisions and departments, field crews, and external contractors 24 hours a day. Most of the work happens out in the field rather than in a fixed office space, and response times have to be fast. To manage its entire network from the field—without having to rely on the office for support—requires mobile GIS, which emerged just a few years ago. The nature of utility management requires constant mobility, which entails using maps in the field and can result in a decentralized flow of information. EYATh had been using GIS technology for more than a decade. Early on, it used ArcGIS for Desktop to create map books that it printed and handed out to field crews. This gave rise to a disjointed process, however. The GIS team had to periodically replace these map books to keep them updated. And field crews weren’t able to contribute up-to-date information to the GIS database when they were out in the field because they weren’t digitally connected to the office or the GIS database. Field crews have instant, online access to all the same technical information, data (vector and raster), and images as staff at their desks. To foster greater connectivity from the field, in 2012, EYATh implemented ArcGIS for Windows Mobile on Windows 7 tablets. Using the Mobile Project Center, the GIS team packaged the data and deployed it on the tablets, allowing GIS to be combined with GPS technology. Although this was a big step forward from using paper maps, crews still weren’t connected to the GIS database when they were out in the field. The utility wanted field crews to be able to relay new information from the ground back to the GIS department quickly and easily so the team could update the GIS server on the spot. 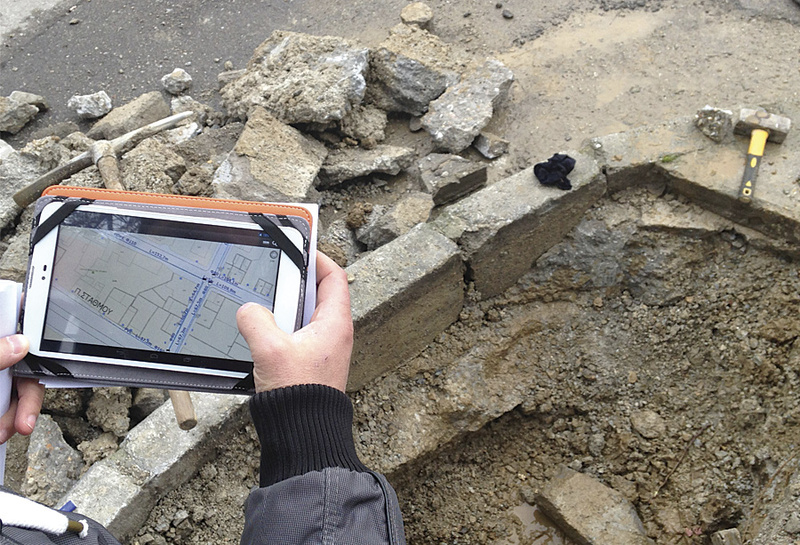 Through smartphones and tablets, everyone at EYATh, regardless of their expertise, gained access to user-friendly GIS. What used to be recorded in spreadsheets and on paper maps—from electrical drawings and billing data to network failure information and historical flooding data—is now stored in EYATh’s GIS server and is instantly accessible online. More recently, EYATh began using Web AppBuilder for ArcGIS to construct its mobile sites. 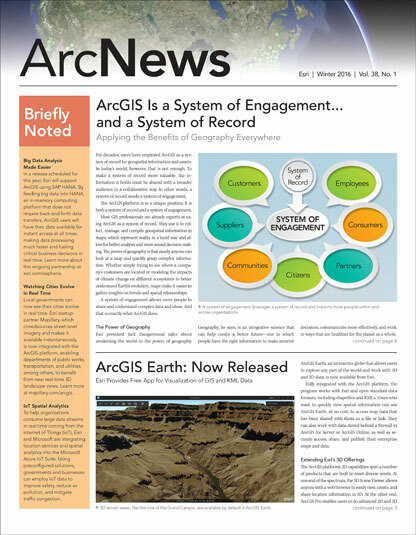 Hosted in ArcGIS Online, these mobile sites allow maps and technical data to be disseminated easily—through the web—to all involved parties, whether they work inside or outside the company. And the applications, which are built with wizards, are platform-independent, meaning they work on multiple operating systems without needing to be modified. Maps are also accessible through a browser rather than a separate application. Most importantly, the applications allow users in the field to give up-to-date information to the GIS department in a timely manner so the team can keep the GIS server updated. 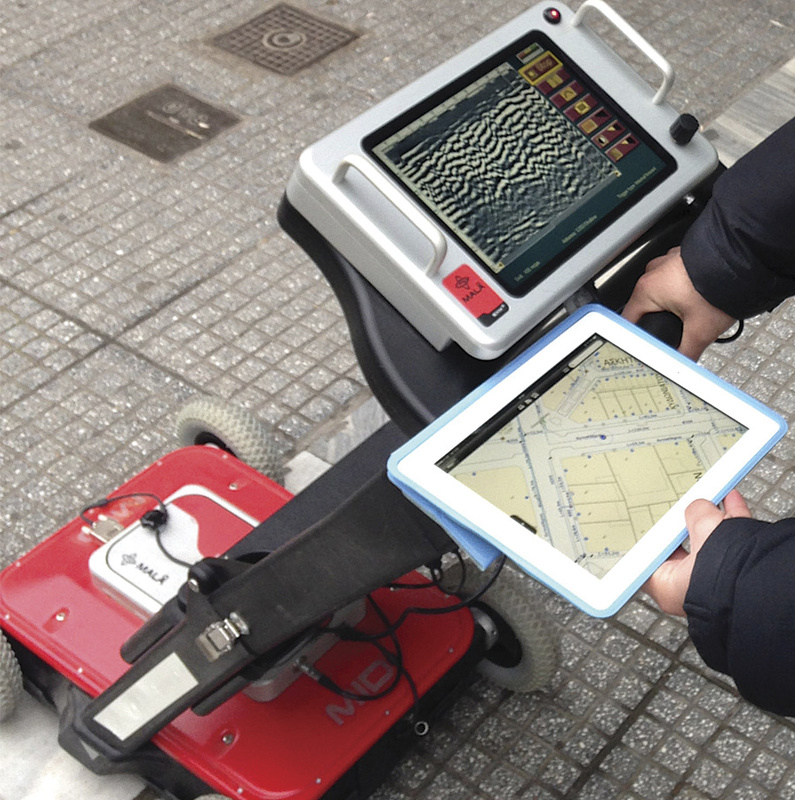 Aided by mobile GIS, an EYATh employee uses a ground-penetrating radar device to more accurately identify underground network assets. EYATh has deployed these mobile sites to address different needs in various departments. For example, ground crews can employ EYATh’s mobile applications to pinpoint exactly where a failure occurs—even if the asset is underground—to ensure that they dig in precisely the right spot. The department of new customers can also use a desktop application to locate buildings that need to be connected to water and sewer service. And, based on information collected and recorded in the field, such as how far away a structure is from existing pipelines, the department of new customers can estimate the cost of service. The utility can also put its complex geoprocessing tools (built with ModelBuilder in ArcGIS for Desktop) into mobile apps by publishing the tools to ArcGIS for Server and then using the wizard in Web AppBuilder for ArcGIS to insert them into web applications. For instance, when the department of design was trying to design a more efficient network, it needed to estimate future consumption needs. The design staff realized that it would benefit from knowing historic billing data for specific areas. So the GIS team extracted historic billing data from the company’s enterprise resource planning software; used ModelBuilder to come up with a model to calculate it for specific, user-loaded areas of interest; and employed Web AppBuilder to deploy a website that staff could use to easily see historic consumption data for particular areas. By now, mobile GIS has become a necessity for keeping EYATh operating 24 hours a day, seven days a week. When customers report damages to the network, field crews using mobile technology can respond more quickly and effectively. Mobile GIS is part of all major network management processes that take place at EYATh daily. With smartphones, tablets, and mobile GIS, the utility has managed to put the office in employees’ pockets. Field crews have instant, online access to all the same technical information, data (vector and raster), and images as staff at their desks. Supervisors use mobile technology to oversee network expansion design and construction—both in the office and in the field. And mobile GIS has even improved route optimization for collecting meter data. Customers are benefitting as well. When they report damages to the network or needs for repair, field crews using mobile technology respond more quickly and effectively. As the call center takes a customer’s call, that person’s location comes up already zoomed in on a map. On-the-go field crews have immediate access to both the failure description and a map of the network status in the area. Before even arriving, crews know where to dig to unearth the failure and what additional network failures to expect. Over the past few years, EYATh has managed to transform GIS from a useful piece of software into a central component of its everyday operations. Mobile GIS has made fieldwork less complicated, enhanced customer support, minimized costs, and spatially enabled technical data everywhere. With mobile GIS, EYATh can now be more efficient and proactive. Ioannis Kavouras is the GIS manager for the Thessaloniki Water Supply and Sewage Company. He holds a bachelor’s degree in rural and survey engineering, a master’s of science in GIS, and a master’s of business administration. He can be reached at ikavouras@eyath.gr. 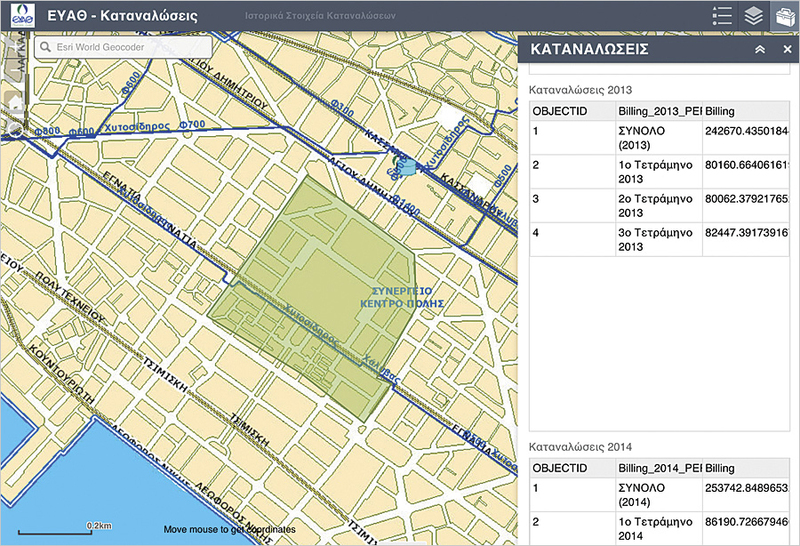 The Thessaloniki Water Supply and Sewage Company won a Special Achievement in GIS (SAG) award for this project at the 2015 Esri User Conference.